Okay, I am nervous right now. This is my very first blog posting and I don’t think anybody will find this or read this posting but why am I still nervous? Would you allow me to go and grab plateful of Japchae and I will continue to write this down as I am eating….? 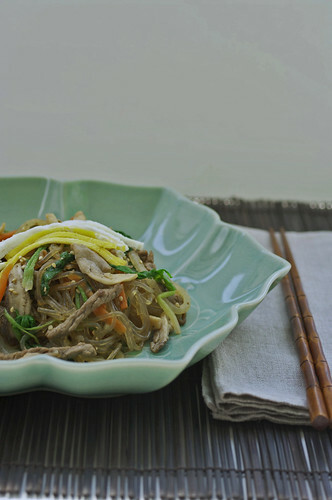 Japchae (잡채) is perhaps the most famous Korean noodle dish. It is a must for any banquet or feast table. You can eat this dish alone or with some rice. This can be a great vegetarian dish as well if yo omit the beef. The key to making flavorful Japchae is seasoning each ingredient separately. Let me show you how you can make this beautiful dish to impress your significant others. Are you ready? For dish: Sweet potato noodles(당면, dang-myon), beef, shitaki mushrooms, oyster mushrooms, spinach, carrot, onion. For seasoning: soy sauce, sugar, sesame oil, sesame seeds, garlic, pepper, rice wine. First, using paper towel gently press beef to remove some blood. Slice beef (cross grain) into 1/4″ sticks as shown above. That’s easy so far, right? Season beef with soy sauce, sugar, garlic and rice wine. Set aside to marinade. Clean mushroom with brush or paper towel. slice or tear mushrooms into strips. Blanch mushrooms in boiling water for 2 seconds and rinse them in the cold water. Now look at these beautiful Korean spinach! You gotta clean them well first by soaking in the water to get rid of all the dirt. Blanch the spinach in the boiling water with a little bit of salt. Be quick on this because they only need 3 seconds to blanch. Mine got cooked 10 second because I HAD TO TAKE A PICTURE! I blanched the spinach right after I did mushrooms in the same water. Squeeze out some excess water but not too much. If you squeeze too strong you are removing too much of it’s own moisture and the spinach will get tough. Season with salt, sugar sesame oil and set aside. Cut carrots into about 2″ long, 1/8″ thick sticks. Slice onion and chop some garlic. In non stick pan heat some oil (I use grape seed oil, olive oil is good choice, too) on medium heat and saute onion with some salt. Set aside. Saute carrots with some salt and sugar until tender crisp. Set aside. Cook the beef in medium heat until done. No oil is needed. 🙂 Set aside. Keep the juice from the meat in the pan. You will use the juice to season the noodle later. Now you have all the ingredients ready. Let them cool down. This is the dang-myun (당면), comes from sweet potato starch. It is slightly thicker than rice vermicelli. When cooked it gives very nice chewy texture. Boil water and just dump the noodles. After you dump the noodle stir them so they don’t stick together. Cook them on medium heat for 6 minutes or follow package direction. Rinse them under the cold running water. 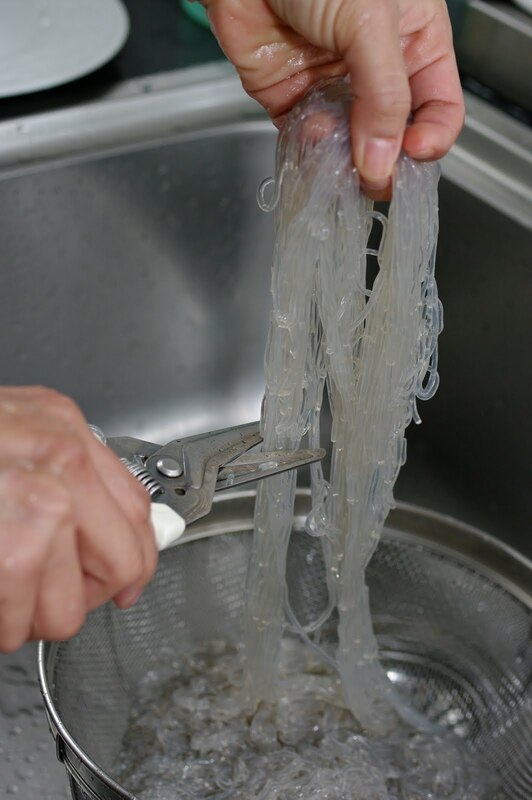 You need to rinse these noodles to get chewer texture. This is important step so do not skip! Massage these noodle guys gently as you rinse. They deserve it. Cut the noodles if you wish. I usually cut them by holding up the noodles with hand. You only need to cut 2-3 times total. Do not cut too many times. Remember the juice from the beef? It has all the good flavor, folks! You heat up the juice again and fry the noodles in it. Add the noodle seasonings and mix well to coat the noodles. Throw all the ingredients and toss them well. Adjust seasoning as you like. You gotta use your hands for this job. Those disposable gloves are handy for this. Finally the job is done! All the hard work is over now. Sit back and enjoy your labor of the day. I am going to eat with style! Mix beef in the marinade. Set aside. Boil water in a pot. Blanch mushrooms first for 2 seconds. Take them out and rinse them in the cold water. Squeeze out excess water. place in a bowl. In the same boiling water add spinach, blanch for 3 seconds. rinse in the cold water as well. squeeze out excess water and place in a bowl. Season mushrooms and spinach each with their seasoning ingredients separately. Saute onions and carrots separately with some salt and sugar to taste over medium heat. Saute beef and cook until done. Reserve the juice from the meat in the pan. Set a side the meat. Meanwhile, boil water in a pot. Add the noodles and stir them first. Cook for about 6 minutes or follow package direction. Rinse them under cold water. Drain the noodles. Cut the noodles if you desire. Cook noodles in the pan with reserved meat juice over medium heat. Add the noodle seasoning and toss them well. Let all the ingredients to cool down to room temp. Toss noodles with beef, spinach, mushrooms, onions, carrots with hand. Adjust seasoning for your taste. Serve in a room temperature. Enjoy. I just made Japchae for a big dinner party on Sunday - served 21 people and still had tons of leftovers! I followed this recipe fairly closely, even before I found this blog, but I think you WERE the one who taught me how to make it. One difference was that I added some zucchini and summer squash, cut in matchsticks. Good stuff! I am glad that I taught you something. You can be creative and add other veges in the recipe. Some people add red or green peppers in the dish. I'm not a big fan of bell peppers in Japchae. To me the smoky flavor of peppers overpower the dish, but it is personal preference. I think zucchini or squash can be good addition as long as you use toward the skin part. The seeded area can be mushy and watery. Hope this helps. this is a famous Asian dish. hmm, looks very delicious. I love vegetables and the colors of it when mixed on noodles. planning to cook a good asian food soon. it's my first time making it, your recipe and instructions were so easy to follow. 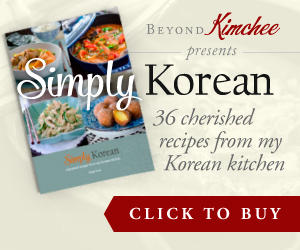 Very helpful cooking hints - i love Japchae! However, I'm lazy, and I cook the ingredients (except noodles) one after the other in a large frypan: onions, garlic, then carrots, followed by mushrooms. Then spinach, and lastly the noodles (which have been prepared per your recipe). I season each batch of ingredients. Then I add pinenuts just before serving (as my dish is vegetarian). wow thanks for the very very detailed instructions and photos! does 'T' stand for teaspoon or tablespoon? T is for tablespoon, and t is teaspoon. Okay, I am nervous right now. This is my very first blog posting and I don't think anybody will find this or read this posting but why am I still nervous? Would you allow me to go and grab plateful of Japchae and I will continue to write this down as I am eating....? Hi! how can I help you? Because I can see my words clearly under the first picture. All it says is that this was my very first post and how nervous I was. Hello hello! I absoulutely love your blog and I'm looking forward to trying all these recipes! Just one question, for this recipe, can you double it by just doubling all the ingredient amounts? Or should it be in another ratio? Thanks so much for all the effort that you put into making this blog fantastic!! You can double the recipe. However, the amount of seasoning on each ingredients doesn't have to be exact to the T. Adjust (+ or -) the seasonings depends on your taste. Japchae is a dish that you can season along as you make. Have a fun making! I am Korean student in Japan. I want to try this someday. Just so you know...the font you used for the first four pictures doesn't work so well for some computers. I'm on XP and I'm using chrome and it comes up as gunk. If I use Firefox things look great but I don't think Chrome likes the font. I just copied and pasted it into an email and it looks just fine! I got to do this one today. My husband, who is constantly comparing my cooking with his Korean mother's cooking, loves it!! He admitted, I cooked this one better than my mother in law.... Thank you so much! Thank you Janeth. I am so happy to hear that. 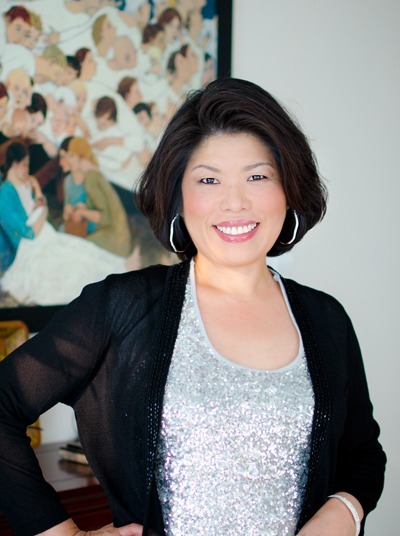 I just started a blog and I noticed that your fabulous blog started with japchae too! Love you site! I made this few nights ago and it was really delicious. I love the crunch of the carrot. And I've never had potato noodle before, but it's so satisfyingly chewy. But, the most important lesson I took from this post is how to get rid of dirt from spinach!! For the life of me, I've never thought to soak spinach before so that the dirt can be washed off and settle at the bottom. 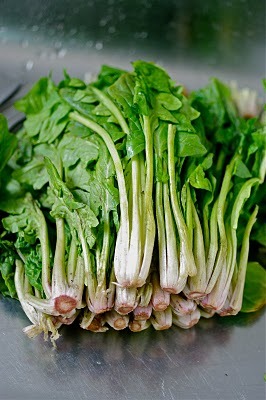 Previously I would only rinse under running water and as such there are always stubborn grains of dirt on the spinach. Hello, i think that i saw you visited my web site so i came to “return the favor”.I am trying to find things to improve my web site! I suppose its ok to use some of your ideas!! Nicely done. Thanks for the photos. It always a big plus to know what brand to buy when cooking. What brand do you like to use for rice wine? Also, what is the white and yellow strips topping on the noodles? Thank you! You can use any brand for rice wine. The yellow and white strips on the dish are fried, then thinly sliced egg yolk and egg white. Thank you for this! I am going to follow your instructions and try to make this myself. Well done! My favorite! Liked the tip about placing the beef on paper towels to drain. Thank you! Hi Holly, I was anxious making this because it's my first time trying Asian food with its different ingredients and way of cooking.. But It turned out very well! Despite few minor changes, I liked this dish so much, and would make it again for sure :) Thanks for the recipe! Wow! I ran across your website by accident looking for a "chocolate sour cream cake" recipe, what a great mistake "what is this kim chee thing?" I thought to myself. 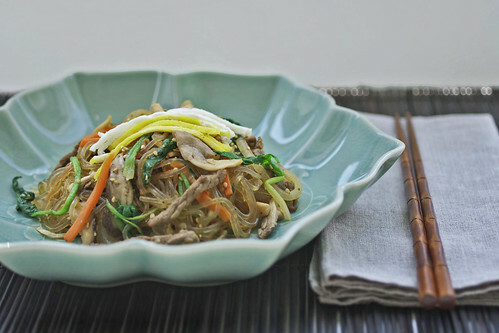 Japchae recipe, I love to eat it but I can make it too? With your great recipe, photos and instructions I made my first batch of the most amazing Japchae, even better than the ones I have at our little Korean restaurant in Hawaii. Thank you thank you. I have read many of your recipes and cannot wait to try them. They all look so good. My only thought is "what recipes can I share with you?" I just made my mother's famous "won ton" filling and thought how I wish I could share these with you. Maybe you already have a recipe for good won tons? Let me know if you don't. thank you thank you again. Hi Deanna Thank you so much for your lovely comment. You are so kind to offer me a recipe in return and I appreciate your thoughtfulness. I LOVE wonton and would love to get your mother's recipe. Please, share with me. Also I am so happy that you liked my Japchae recipe. Homemade is always better, isn't it? 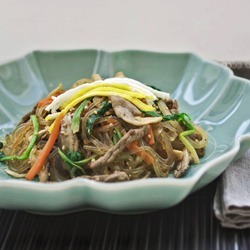 Hi Holly, I have tried all your 3 recipes for Japchae and all 3 are lovely. We end up taking 2nd and 3rd helpings. Thank you. That is so great! You made my day so happy! Your blog is a new discovery for me and I'm so excited I found it!! Being half Korean, many of these dishes are very familiar to me. Sadly, I never took the time to learn from my mother when she was cooking in the kitchen. Since she is no longer here, I am deeply grateful for these WONDERFUL tutorials you've presented. I find your clear descriptions and colorful photos very helpful. A few days ago, I made the cucumber kimchi and tonight, I made the Japchae. What a treat...to take me back to my childhood with all the familiar smells of red pepper, garlic, sesame seeds and soy sauce...ah, mom would be proud <3 Both dishes were just as delicious as I remember. Thank YOU!!! Thanks for your sweet comment. It is my utmost pleasure to hear that my recipes are helping other people to remember their childhood memories. Food has a great power to do that. Hope you continuously enjoy your Korean cooking. Hi Jacek Glad to hear that you like Japchae. Hope you get to try my recipe and let me know if you have any questions. Cheers! One of my all time favorites and deceptively easy to make. Hello! I can’t wait to make this recipe next week to celebrate the opening ceremony of the Olympics in South Korea! Can you tell me a substitute for the 1T of rice wine ? I prefer to not cook with alcohol! Thanks! Should I increase the proportions of anything else if i am omitting the rice wine? No need to increase anything.